Certainly, there are vulnerabilities on the cloud. Your data’s stored elsewhere, subscriptions mean you can’t just cancel without a migration plan, and an insider threat may be more empowered to do harm. But just because there are cloud-specific security threats doesn’t mean you can’t reside safely on cloud services. All it takes is a little planning. You’re giving a lot of power over your data to your CSP, and that means you have to be confident they will be good custodians. Whether you’re considering something as lightweight as a dedicated filesharing service or as comprehensive as Microsoft Office 365, SharePoint, or Azure, you need to understand the security on offer. Is their data centre physically secure, and do they have a plan for catastrophic data loss? Can they speak confidently about compliance standards? Have they previously been the subject of a mass data breach? You may be tempted to assume that a company as large as Microsoft is big enough that they take care of everything, but things like Office 365 are complex systems that require the correct configuration to maximise security for your needs and prevent cloud vulnerabilities. A key part of any deployment should be ensuring it’s set up right. 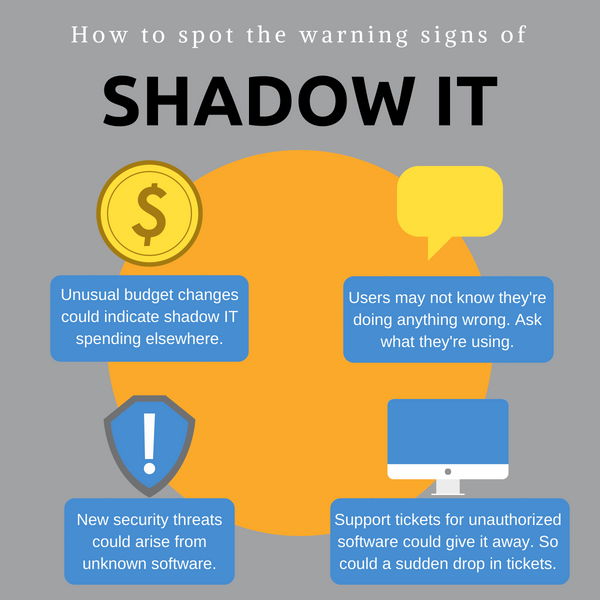 When users take it upon themselves to use software without authorization of the IT department, they’re engaging in shadow IT. With the ease of use and provisioning of many cloud services compared to the installation process of traditional software, this kind of vulnerability can fly under the radar of inattentive IT departments. IT can’t protect what it doesn’t know about, and users are unlikely to have vetted these services to the standards the company requires. Sensitive data could be shared on insecure filesharing services, or worse, the service itself might exist purely to install malware. Shadow IT is a sign that users feel there is a deficiency in the officially authorized set of available services. Make sure that employees throughout the company understand that and why there is a process for adopting new technologies, and if users are held back due to inefficient approved services, do your best to find a good solution that accommodates them. Any company must extend some trust to its employees in order for them to get work done. They may need access to sensitive data, or they may be trusted to provision new users. The chance of a disgruntled employee sabotaging the company from within is not something you can guard against with 100 per cent success. Especially when with cloud services — they don’t have to be on-premises to do it. That’s a new cloud vulnerability. But it is something you can take steps to mitigate. For one, only employees who have demonstrated trustworthiness should be given the deepest access. If someone’s due to be terminated, IT should be ready to deprovision the user swiftly, before they have a chance to do damage. When a fired employee can log into a service from their personal cellphone minutes after they get the news, you need to have a plan to prevent that. As you migrate to the cloud, you’re giving more power over your data and service away to CSPs in exchange for greater convenience, capability, and flexibility. This is a good deal for many companies. The flipside of that is the more cloud services you sign up for, and the more of your business processes and data rely upon them, the harder it will be to extract yourself should the day ever come. With a cloud software subscription, you do get the latest versions, which enhance your security and productivity. But unlike legacy software licenses that don’t expire, ending a subscription means you’re cut off. If you’re making the leap, be certain that your needs are completely met and that you’re ready to remain on the cloud for the long haul. These are just some of the ways you can combat vulnerabilities on the cloud. If you’d like to know more and discover the benefit of an IT firm full of cloud experts as a partner, explore our Enterprise Solutions service. Or, check here for a comprehensive eBook on the transformation the cloud offers. Whatever you need — cloud security, migrations, a review or deployment — we work closely with companies of all sizes to deliver the right growth-centred solution. The challenges never end for CSOs. But if you're looking at anything from a quick security consult to a full scale cybersecurity solution deployment, start here.